This Super Bowl Sunday, when you attend your party of choice take a minute to look around the room and see which beers your friends are drinking. According to National Media Research Planning and Placement there are distinct correlations between your beer and liquor preference and your partisan leaning. This data wasn’t pulled together based on stereotypes. Over the past decade more and more tools have been developed to target the smallest fraction of the electorate. Surge’s of consumer data has been acquired by methods like tracking credit card usage and has now become a weapon in the political world. This data not only identifies your political preference and voter turn out but it also defines the type of clothing you wear, the brands you buy, television shows you like to watch and what type of spirits you like to drink. With all of this advanced technology the most interesting findings are the major differences in taste and lifestyle amongst liberals and conservatives. Politicians use this data during elections to strategically pick what methods and messages will appeal the most to their target audiences. The findings show that Democrats and Republicans differ in every type of life style preference; drinks, cars, even certain restaurants they enjoy going to. While most findings in these studies reflect some stereotypes many are surprising and contradict the mass media’s view of Conservatives specifically. Lets get back to beer and politics and its interesting partisan patterns that come along with alcohol consumption. 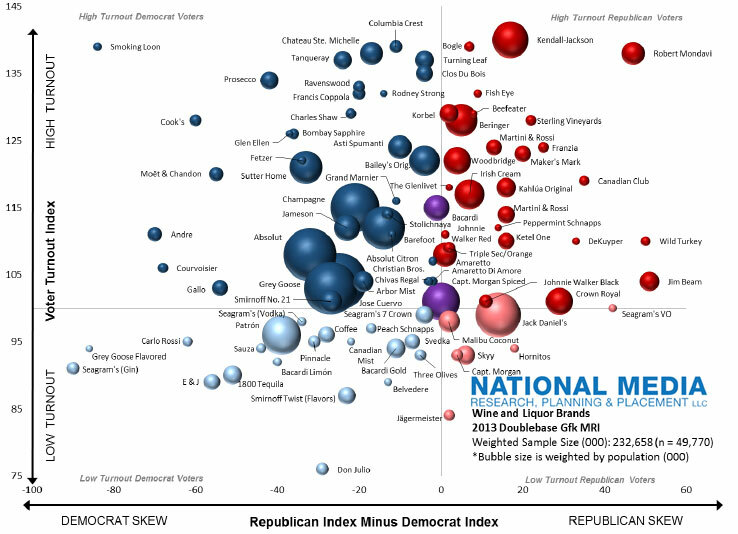 When looking at the chart by NMRPP the data displays that Democrats are most likely to consume lighter color and more expensive liquors like champagne, gin, and vodka. Also, by a long shot, cognac is the Democratic parties drink of choice. Republicans tend to drink dark brown liquors and moderately priced wine. As for beer, republicans consume lighter beers like Bud Light, Miller Lite and Coors. While democrats enjoy Rolling Rock, Milwaukee’s Best, Miller High Life and micro brews. This study also found interesting patterns in voter turnout rates. For example, according to the Washington Post someone who likes single malt scotch is more likely to go vote than bourbon and Canadian whiskey drinkers who have the lowest turnout rate. When it comes to beer and wine drinkers, wine drinkers are more likely to cast a ballot. Democrats and Republicans also have different preferences when it comes to wine. Republicans are much more likely to drink Cabernet Sauvignon, while democrats overwhelming choose to drink white wines specifically Sauvignon Blanc. Why is this data so interesting? Well one reason is that these findings contradict most media and Hollywood portrayals of GOP voters as evil capitalists. Average GOP voters spend less money on their beer and alcohol than the average liberal. These consumer patterns also show the growing divide between the GOP leaning middle class voters including most college graduates and the democratic parties very affluent progressive post-graduates and on the opposite side of the democratic spectrum the people of very low income. According to the data, GOP voters drink decently priced wine and nice dark liquor. Liberals spend their money on more costly alcohol like grey goose and champagnes… ever heard of the term limousine liberal? Whether or not you found this study to be true to your own preferences, the information is bound to make you more aware of your closest circle’s spirits of choice. Remember to be alert this Sunday and Cheers! Tags: beer, broncos, Democrats, limousine, Republicans, seahawks, superbowl2014. Bookmark the permalink. What an amusing premise! I don’t know if I believe the data since my own habits contradict it (don’t like ANY American beers, will sometimes down an expensive G&T but prefer Cabernet Sauvignon), but I can see the logic that conservatives would generally care more about price than quality.